10 February in Amsterdam: Bach & Bach ! Sunday 16 december at 15.00 hrs you can visit the Christmas concert at the Sint-Servaasbasiliek in Maastricht. Special guest is Frank Steijns who plays the carillon which is placed in the church! Of course the Cappella Sancti Servatii performs the Christmas songs, Marcel Verheggen plays the organ. 8 November 2018 at 20 hrs I play a concert in Nederweert to grace the the start of the restoration of this organ. Tonight, he organ builder van Rossum signs a contract with the board of the church for the restoration. It will be the last time the organ will be used in a concert setting as it is now, since it will be restored to the original situation back to 1849. Sunday, 4 November at 15 hrs, I play a concert in the Sint-Servaasbasilica because of my jubilee: 1 November 1993 I was appointed as organist of this beautiful basilica with its magnificent organs. I got a lot of requests to play certain favorite pieces. Well, I’ll respect these requests as much as possible, it means the program is set by the audience which listens every week in the church to the organ in the Holy Mass. Walking around In the centre of Brussels, you may encounter a beautiful church with a beautiful organ: the Finisterrae church with an organ by Loret. Almost every Monday you can listen to the organ from 12.45 – 13.30. Upcoming Monday, 8 October, it is my turn. You can listen to music by Boëly, Andriessen, Jongen and Froidebise. Enyoy! Upcoming weekend, a lof of thrilling events will happen in Maastricht. Find the entire program at: http://www.musicasacramaastricht.nl/programma/volledig-programma. 23 September I play during the High Mass in the the Sint-Servaasbasiliek. It starts at 10 pm. You can listen to the mass for two organs by Louis Vierne. 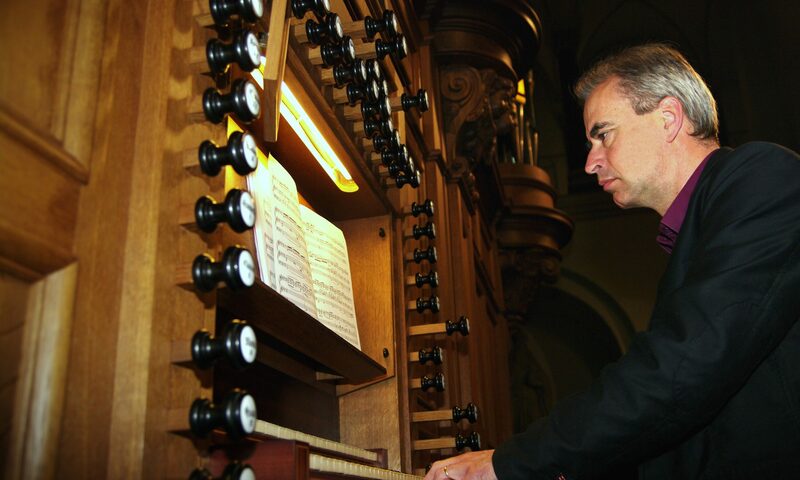 The second organ will be played by Arno Kerkhof, Hans Heykers will conduct the Cappella Sancti Servatii which is enforced with the vocal ensemble Silhouet. In the afternoon you can hear in the same church the famous Psalm 94 by Julius Reubke, played by me. Together with Fête-Dieu by Hendrik Andriessen and Kol Nidrei by Max Bruch it is an outstanding program to conclude this festival. The cello part is played by Mirel Iancovici. This events starts at 5 am. Tuesday 11 September 2018 I play a concert in the Basilica ‘St Aposteln’ in Köln. What is SKEN? SKEN is a national organization which aims to broaden the interest for cultural heritage, especially the sounding cultural heritage: organs and carillons/bells. In these days, a thrilling program is set up to bring alive in most unexpected ways the richness of the organs and carillons of the city.